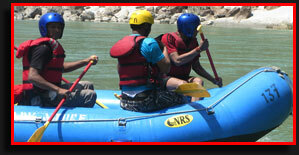 Garhwal, the part of Uttrakhand that borders Himachal Pradesh is the home of the river Tons. Rising from the Bandarpunchh Mountain range at 20,720 ft., the river is the biggest Yamuna tributary and is believed to have more water than the Yamuna itself. 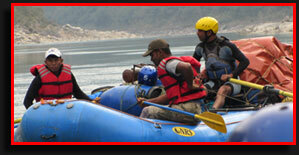 The Tons river expedition provides you the thrill of running a river that have grade 3-4 and even some grade 5 rapids. It is considered to be one of the most challenging white water rivers to run in the country and has a lot of adventure to offer. Tons valley is a remote area and has a culture unlike any other in the region. The villagers in the Tons valley are believed to be descendents of the Pandavas and Kauravas from the epic Mahabharata. It also has some uncommon traditions such as that of polygamy. The Tons offers one of the most technical river expeditions in India and has plenty of rapids spaced together with flat water. You will spend the day on some of theindia-tons-river-rafting most exciting whitewater rafting, with rapids such as ‘On the Horns of the Tons’, ‘Tons Squeeze’, ‘Confluence’, ‘Tuni Bazaar’ with late afternoons and nights spent relaxing and enjoying the riverside camp. The last stretch of rafting and kayaking will take us through the gorge and bring us to the ‘Major Surprise’, the biggest rapid on this trip. Our river expedition ends at Minus. This river expedition brings one closer to nature as well as gives you an opportunity to discover a new side to yourself. Arrive rishikesh and drive to the Tons valley. With breaks for meals we arrive at the campsite well before it gets dark. Set up camp for the night by the Tons River. Morning after Breakfast we wake up to the gurgling sound of the river, tempting you to begin your river expedition. After a talk on safety as well as basic paddling instructions one begins rafting at Mori and ends the day at Khunigad. Back to the camp by afternoon, you can choose to relax on the beach and watch the sunset, orgo for a short hike into the Pine forest. Dinner around the campfire is a great place to share experiences of the adventures of the day. Start the 60 km river run. Spend the first two days covering a section from Mori to Tiuni. 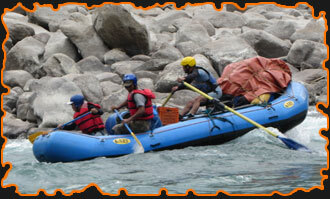 Here we encounter some grade 4 rapids and a lot of smaller ones, which are sure to get your adrenalin pumping. In the late afternoon we pitch camp, where we can trek into the beautiful alpines pastures or the pine forests. Dinner is buzzing with excitement over the next day of rafting and kayaking and your river guide will have plenty of stories to share. Set up camp for the night by the river. From Tuni, the river starts to pick up volume as the river Pabbar joins, providing more volume and terrific white water. After the thrill of the top and middle section of the river expedition we now move into a beautiful gorge. Paddle through some of the country’s best white water during the day and set up camp in the late afternoon to explore the surrounding area. The last day on the river expedition, we will paddle the way down the river through a black tropical canyon. At Minus we finish our trip and are met by our vehicles to drive us to Rishieksh.